Copyright © 2019 PT SMC Pneumatics Indonesia. All Rights Reserved. SMC Pneumatics (Indonesia) is the Indonesia subsidiary of SMC Corporation, the world’s largest pneumatic part & system products manufacturer that has been established in September 2012. 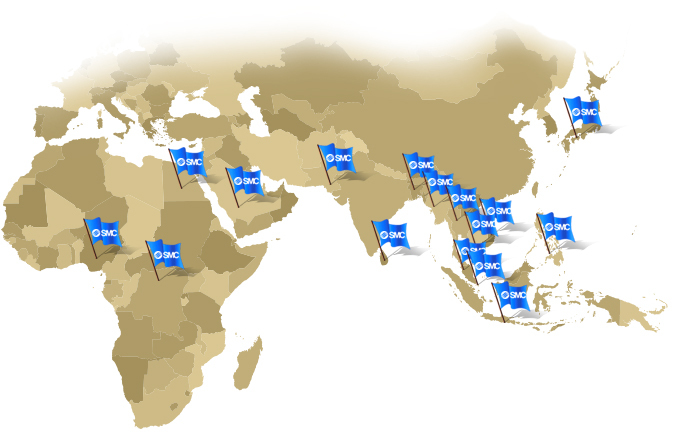 SMC Pneumatics (Indonesia) are established throughout our extensive dealer network in major cities such as Medan, Surabaya, Semarang, Bandung, Balikpapan and Pekan Baru. We will actively serve the Indonesia market by leveraging on our strong partnership with our distributor, PT Sinar Mutiara Cemerlang. Our Products offered range from valves like solenoid valve, process valve, to thermo equipment like thermo chiller, thermo cooler and heat exchanger; from actuators, like electric actuator and linear actuator a myriad of electrostatic eliminator equipment as well as pneumatic part such as air gripper, air cylinder, electric cylinder, refrigerated air dryer, ionizer, air compressor & etc.